Japanese Episode DP 158: "Loud Roar! Jibacoil vs. Metagross!!" American Episode 1301: "Regaining the Home Advantage!" On their way to Asatsuki Town, Satoshi and his friends run into a Jibacoil engaged in a battle with a Metagross! Their battle is causing trouble inside the city, so Satoshi and his friends join the battle in an unsuccessful attempt to put an end to their fighting. Takeshi notices a nearby mountain, so he suggests they try to lure the pokemon out of the city to prevent any more collateral damage. Using Pikachu's and Pachirisu's electric abilities, Satoshi and his friends are able to successfully lead them to the more remote mountainous area. Once there, they meet a man named Katsuzoh who seems to recognize the fighting pokemon! He tells everyone that the mountains in the area send out magnetic waves that build up inside the pokemon's bodies, requiring Jibcoil and Metagross to spar every now and then to release the pent up energy. They had been using an empty basin as their battleground, but for some reason it recently filled up with water. After a bit of investigating, Satoshi and his friends notice that a boulder is redirecting the flow of a river toward the basin. Takeshi's Gureggru breaks it, preventing the basin from filling up again. Later, Hikari uses her Mimirol to freeze the water, allowing Takeshi's Pinpuku to pick it up and throw it off a cliff. Jibacoil's and Metagross' old battleground has been restored, so the two pokemon resume their sparring without endangering anyone else. With the pokemon's problems solved, Satoshi and the others resume on their path to Asatsuki Town. When this episode first aired in Japan, it was pretty much overshadowed by the super spoiler-rific opening theme that accompanied it. "Who cares about this boring filler," people thought. "Ash is gonna get an Infernape!!" It's kind of a shame that that happened, though. The way I see it, this episode is classic Kanto. Just look at what we have going on here. A Jibacoil heads toward a city, so Satoshi and his friends drop everything they're doing to go stalk it. After Takeshi gives his Oran Berries to the only three people who seem to be living there, they find the Jibacoil fighting with a Metagross. Their battle is going to damage all the empty streets and non-existent cars and unoccupied buildings, so Satoshi and his friends decide that the only way to stop the collateral damage is to do the exact same thing the pokemon are doing. After Pikachu inexplicably clones itself, the steel-type pokemon get bored and leave. The plot needs them to come back, so they stop fighting for the entire second half of the episode and just sort of calmly float there while the character-of-the-day explains how the rain that never falls in this series filled up a basin. Takeshi, who's being rather helpful all of a sudden, has his Pinpuku break the rock that the COTD was too lazy to find himself. Then, when the water doesn't drain itself immediately, Takeshi decides that the the only logical thing to do is to freeze the lake and have his pokemon throw it into a conveniently nearby chasm. Because he has no reason to assume that his insane plan won't work, right? It does, however, and the day is saved. Oh, and also, everyone acts like complete dicks to the Rocket-Dan, on multiple occasions, for no adequately explored reason. See? This insane episode would have fit right in. The English version is the start of a new season, but everything here is, predictably, the same as it always is. A tiny part of me always goes into a new season hoping that this will be the season where the dub wises up and finally gives us the Japanese music that we want, but no such luck. In fact, I think this episode sports all-new dub music, which tells me that the company is committed to subjecting us to their ill-fitting music for many years to come. Metagross keeps its Japanese voice. Saikoh Everyday! replaces High Touch! 2009 as the opening theme, while the dub theme changes from Battle Cry - (Stand Up!) to We Will Carry On! This is the first time the opening themes in both Japan and the U.S. changed at the same time in the middle of a region, so I guess that's pretty special. Brock: "It's not hurt badly. Once it wakes up, feed it this Oran Berry and take it to a Pokémon Center. It'll be fine. You can do it." Originally, Takeshi's last line there is telling the Ordile trainer that since he's a boy, he shouldn't cry. Since, hey, sexism is cool. 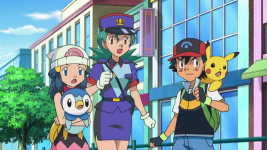 Later on, the dub makes Brock's advances toward Officer Jenny rhyme, as if he's reciting love poems or something. Takeshi does not. Meowth: "Best friends. Joined together and ready for a trip down the hatch." Team Rocket: "Hunger itch? It's the perfect scratch!" Originally, the Rocket-Dan call the combination of butter and jam on toast "luxurious," which is actually really cute of them, in my opinion. The fact that the Rocket trio considers something as mundane as toast to be high-class is lost because the dub wanted to make them poets again. Jessie: "Say we get to the bottom of this mess. Then, if we apply a little diplomacy, we can end up with twin titans for Team Rocket!" James: "And it came from you!" Kojirou and Nyasu don't insult their teammate originally; they just agree with her and say that Metagross and Jibacoil will be strong allies for them to have. Crispin: "However, as soon as the basin filled up with water a few days ago, the two of them simply disappeared." According to Katsuzoh, the basin filled up with water "yesterday," not "a few days ago." James: "Drat! And on top of it all, I still haven't enjoyed one taste of my toasted jam." Jessie: "You and your stomach...you're a pathetic pair!" Meowth: "I thought I was so slick. What do we get?" Team Rocket: "Team Rocket's blasting off again~!" We can't get let this episode end without one last mean-spirited jab from one Rocket to another, now can we? In the Japanese version, all three of the Rocket-Dan members are expressing how disappointing their day had been. Kojirou didn't get to eat his first-class toast, Musashi did all that work trying to help out and has nothing to show for it, and Nyasu was ignored by the two pokemon he was trying to chat with.